Can you confirm these amateur observations of Tetradactylus udzungwensis? Type locality: Bomalang’ombe grasslands at 1880 m elevation (08° 11’ 36.7’’ S, 35° 51’ 52.7’’ E), Gendawaki valley, Kilolo District, Udzungwa Mountains, South East Tanzania, collected on 7 March 2002 by M. Menegon, S. Salvidio and R. Sindaco. Diagnosis Diagnosis: An elongate seps, with four small limbs, having three fingers and two toes. The median front toe bears four scales. 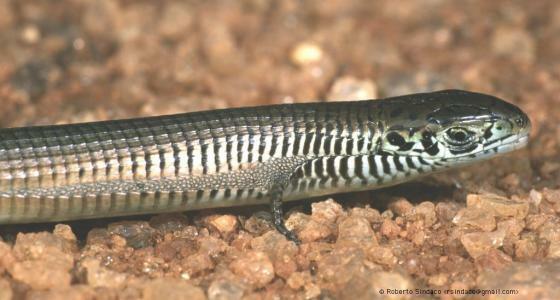 Head with smooth scales, frontoparietals are in broad contact and nostrils pierced between two nasals; four femoral pores are present on each hind limb. endemic T. eastwoodae Hewitt and Methuen, 1913. This species, at present considered extinct, is known only from two specimens collected from Woodbush Forest Reserve, Naphuno District, Limpopo Province by A. Eastwood in 1911 (the holotype TM 1496, conserved in Transvaal Museum, Pretoria) and by V.A. Wager in 1928 (TM 13104). However, in T. eastwoodae the two frontoparietal scales are completely separated by a very elongated interparietal in the holotype (Hewitt and Methuen, 1913; Jacobson, 1988), and are in narrow contact in the topotype TM 13104. In addition, T. eastwoodae possesses only three femoral pores and a different scalation of the middle front toe (i.e. only two scales). These differences represent diagnosticcharacters distinguishing T. eastwoodaeand T. udzungwensis (from SALVIDIO et al. 2004).